We are keeping this entire year as a celebration of the 150th anniversary of the first Mass offered in St Clement’s in 1859. Whatever else St Clement’s has done through this century and a half, the faithful re-presenting of Christ’s sacrifice on the Cross is the most important. 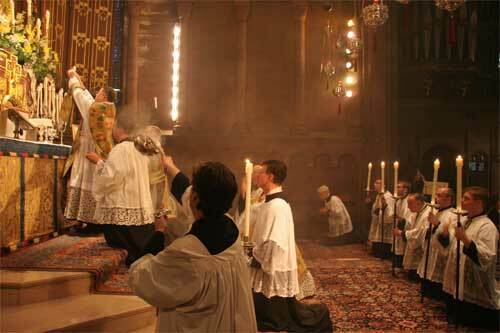 From this weekly, and then daily, offering have come vocations to the priesthood and the religious life, many works of charity and mercy, priests and laity whose influence has spread throughout the Church. Almost half way through this year, I have to record that we have been inspired by our special preachers who have all commented on what St Clement’s has meant in the Episcopal Church’s life, and what it can continue to contribute in our own day. Now we turn to the second half of our Sesquicentennial Year with anticipation, for we have some splendid Feasts to celebrate and some very special preachers to help us celebrate. First, on Corpus Christi, Thursday, June 11, we have the Rector of St Thomas’s, Fifth Avenue, New York, Fr Andrew Mead. St Thomas’s has the only English-Cathedral-like Choir School in America and produces some of the best music of any Episcopal church in its liturgy. Then, on the Feast of the Assumption of Our Lady, Saturday, August 15th, our guest preacher is to be Fr John David Van Dooren, Rector of the Church of the Atonement, Chicago. I knew Fr Van Dooren when he was Rector of All Souls’ Church, Washington, D.C. and he and I exchanged churches for three week one summer, he going to Milan, and I to Washington. One of my oldest friends (in time, not age!) is coming to preach on Sunday, September 20, the Feast of the Seven Sorrows of the Blessed Virgin Mary. That is Prebendary Bill Scott, formerly Vicar of St Mary’s, Bourne St in London, and then Chaplain of the Savoy Chapel. He now rejoices in the titles of Sub Dean of the Chapel Royal, Sub Almoner, Deputy Clerk of the Closet, and Prebendary of St Paul’s Cathedral. But, just as important as all that, he is also a Guardian of the Shrine of Our Lady of Clemency here at St Clement’s. Just two weeks later on Sunday October 4, we shall celebrate the Feast of the Holy Rosary, and our Preacher will be Canon Martin Warner who is Canon Pastor of St Paul’s Cathedral, London. Canon Warner was for several years Administrator of the Shrine of Our Lady of Walsingham and is now Master of the Guardians there. The last of our special preachers (on All Saints Day) will be Fr David Kennedy, Rector of the Church of the Holy Angels, Lantana, Florida and Past Master of the Society of the Holy Cross; Brother Steven Haws of the Community of the Resurrection, Mirfield, on November 1; and Fr Fred Robinson, Rector of the Church of the Redeemer, Sarasota, Florida on Nov 23, St Clement’s Day; and finally Canon Len Black, Rector of St Michael and All Angels, Inverness, Scotland. He will preach on Tuesday, December 8, the Feast of the Immaculate Conception of Our Lady. You must admit, we have produced quite a star-studded cast, and priests with a great wealth of experience in the Anglican Church. The 151st Year will seem pretty dull with just Fr Wall and me preaching!